If you are looking for an amazing dance fitness programme then Popdance Fit is for you! Due to demand from customers, teachers and fitness instructors, Popdance, who were established in 2009, have created a programme that is an exciting dance based workout class – giving the opportunity for more of a sweat, more toning, and a faster fitness class – yet, still dance based. Popdance Fit is suitable for dance teachers as well as fitness instructors to teach. The Popdance Fit Training Programme is for qualified dance teachers and min level 2 exercise to music fitness instructors and fully endorsed by Skills Active and REPs.
All those attending the training will benefit from 16 REPs. 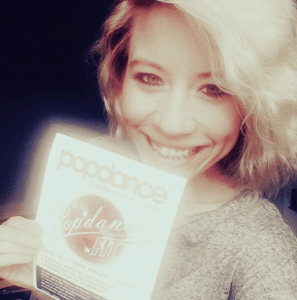 So what are the benefits of becoming a Popdance Fit Instructor? It’s £165 for the Popdance Fit Training Day which gives you 16 REPS points, 6 hours of training, a Popdance Fit T-shirt or vest, and all the information you need to start your own classes, or run Popdance Fit classes with us. You can stop your monthly payments at any time (just give us one months’ notice). PLUS, you may be eligible for a bursary from The EMD Academy!!!! Take a look here for more information or email us at info@popdance.co.uk to find out more! Get a training grant to progress your dance fitness career! Do you want a career doing something you love? Want up to £150 towards your training fees? Yes? Then look no further, The EMD Academy Open Bursary Scheme can help.